Female-fronted pop punk that sounds like all the other pop punk out there. 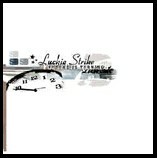 Though, unlike other pop punk bands who feed off of the bands they're imitating, Luckie Strike sets themselves apart from the masses with a cover of "Radio, Radio" by Elvis Costello. Their version, of course, doesn't come close to Costello's original. But, it is an interesting, if not refreshing, break from the generic pop punk that has shed plenty of influence on this album. When all is said and done, Luckie Strike delivers catchy pop punk that the kids are sure to enjoy. And isn't that what matters? I'll give it a C+.